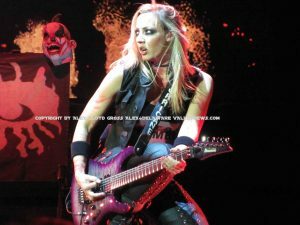 Alex Lloyd Gross- Photo- Delaware Valley News.com Nita Strauss live. 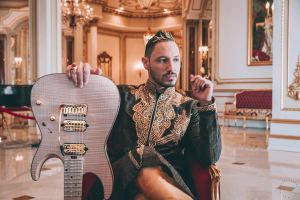 Angel Vivaldi is an accomplished guitar player. He is very good. He is also coming to Voltage Lounge on November 20, 2018. ” I play for about 50 minutes”. Vivaldi has been playing for about 20 years,. His albums consist of instrumental tracks. Live, it’s the same thing. “Early on, I would be asked about the lack of a singer, but that was a very different time, for progressive artists. Within the last seven or eight years, people have started to get it and the way I write the songs is very powerful. People lose themselves in it.There is no specific set of lyrics. There is no particular way to feel about a particular song,” Vivaldi said during an interview to promote the show. Most of Angel Vivaldi’s songs are hard rock with a few slower ones tossed in for good measure. When asked about his favorite type of song to play, “Slower songs are okay but there is not a lot of velocity to hide behind. I like the medium tempo songs, songs that I can run around and not have to concentrate on the difficult sections,” he said. This is being billed as the Guitar Collective and special guest Nita Strauss is opening the show . Nita is best known as Alice Cooper’s guitarist. Before the show, there is a little VIP program where Nita and Angel come out and take questions from the crowd. “What ever direction people want to take their VIP experience to, we will do, but not so much individual lessons. This is Nita’s first solo tour. You can bet that both artists will have merchandise, including t shirts and CD’s for sale there. Vivaldi said that “After the show I like to stick around and go to the merchandise table, so it’s pretty easy to meet with me,”. There are times that the band is exhausted after the set and it’s difficult to stick around if they have a long drive to a show the next night. Voltage is located on North 7th St. Next to the Electric factory, ( or Franklin Music Hall). Some tickets to remain. You can go here to get yours. After you bought your tickets, check out Angel’s website, he offers consulting and lessons To learn more about Nita Strauss her site is here.